This plant is native to the Canary Islands, the form with red striped leaves apparently comes from the south-eastern parts of La Palma Island. 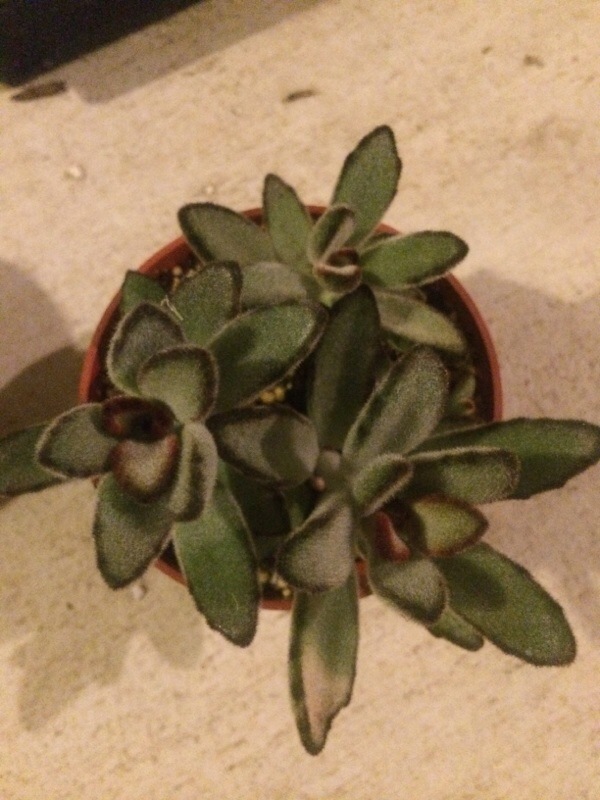 A small succulent plant that has delicate branching stems to not much more than 6" tall and wide bearing small rosettes of ½" long rounded sticky lime green leaves streaked with red stripes that radiate upward in the rosette. In spring appear the bright yellow star-shaped flowers. 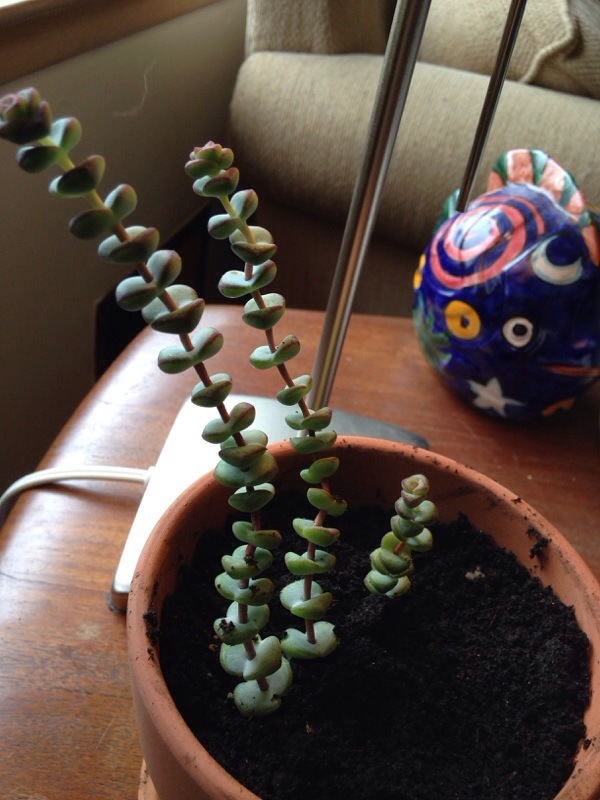 Plant in full coastal sun to filtered light in a well-drained soil and protect from frost. 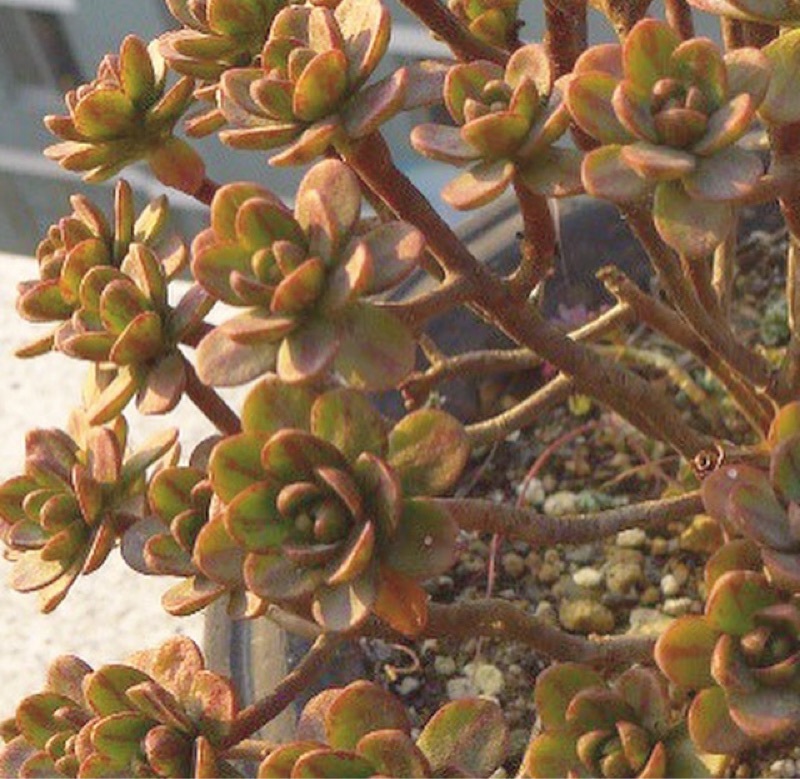 As the species name implies, this plant has leaves like that of the genus Sedum. 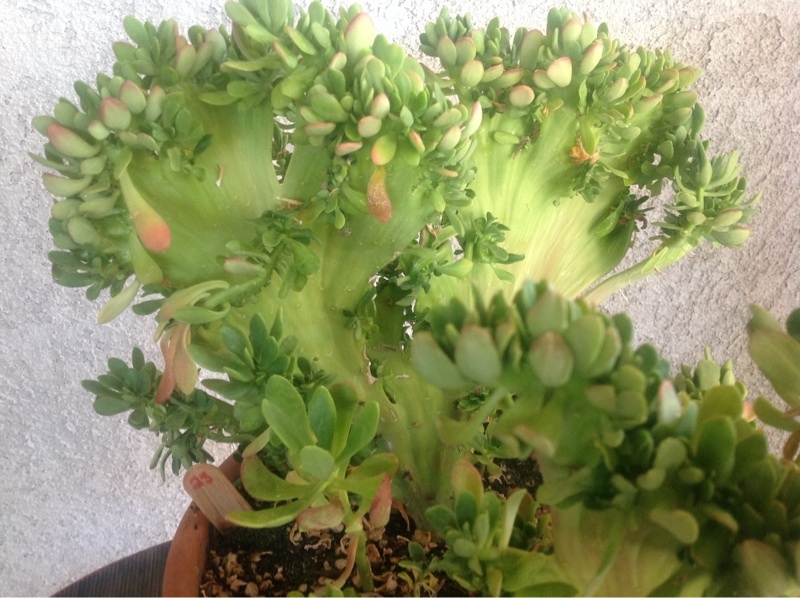 It is said that this plant can be used much as Aeonium lindleyi is used to provide relief for the irritation caused by skin contact with Euphorbia latex. Thank you very much for your follow up photo and apologize that we did not check on our previous answer last month that showed more of the plant itself. This is likely a Kalenchoe blossfeldiana. It has thick, glossy green leaves that are smooth-edged or lobed depending on the cultivar. A popular gift plant, it blooms primarily in winter through spring with clusters of tiny flowers in hues of orange, red, pink, cream, yellow, pink and salmon. Indoors needs bright indirect light, moderate water and fertilize with a slow-release food formulated for container blooming plants. Water when the soil feels dry down to the first knuckle or pot feels lighter. Do not over water. Outdoors, provide bright filtered light/partial shade, especially in the summer. Does not tolerate frost. Here are a few care tips and information about your crown of thorns plant. 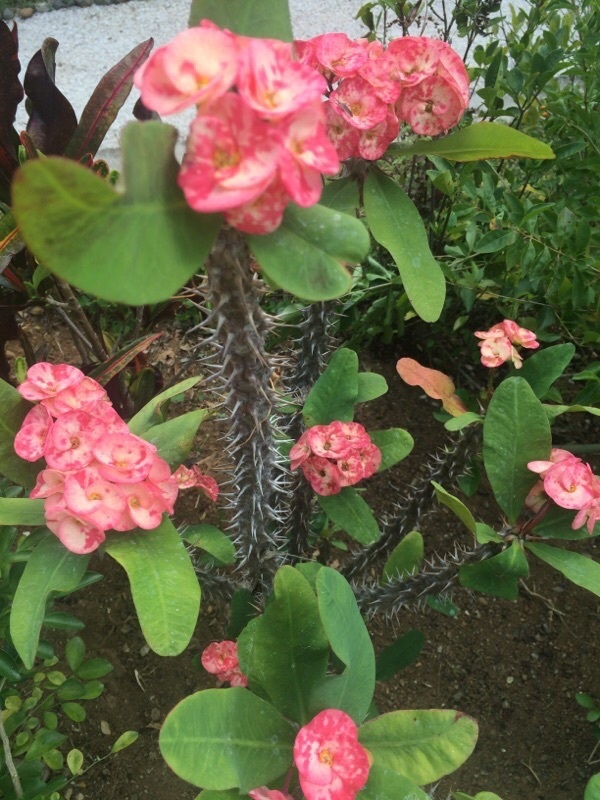 Euphorbia milii, is a succulent plant in the same family as the poinsettia, the thorns cover stems that ooze latex sap when cut. This is a common characteristic of euphorbias and is not a sign of disease. 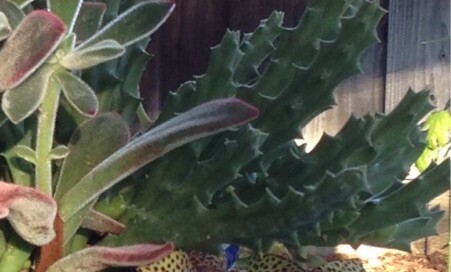 Use gloves when handling this plant to protect your skin from both the thorns and the sap. Indoors needs bright, indirect light and water only when soil feels dry to the touch down to the first knuckle. Outdoors provide full or partial sun and water sparingly. Does not tolerate frost. Flowers may be red, yellow, pink or white, or even bi-colored depending on the cultivar. Feed with a slow-release or organic fertilizer formulated for blooming container plants. Sedum praeltum, native to Mexico, forms a shrub to 3' in height. Spatulate leaves are shiny lime green, often with red margins in bright light. This is an unusual cristate form that grows laterally as fan shapes that are densely topped with lime green leaves. Cristate forms generally occur when injury occurs to the plant at a young age (this damage can be due to insects eating the growing tip, or from many other causes, including a genetic predisposition). In reaction to the "injury", the cells at the tip of the branch where growth occurs begin to multiply at a much faster rate and the normal growing tip "goes crazy", creating fantastic whorls and fans. Porous soil with adequate drainage. Bright light to full sun. Water thoroughly when soil is dry to the touch. Protect from frost. The plant appears to be an Agave of which there are many species and cultivars but all are monocarpic, meaning once it blooms the "mother" plant will die. 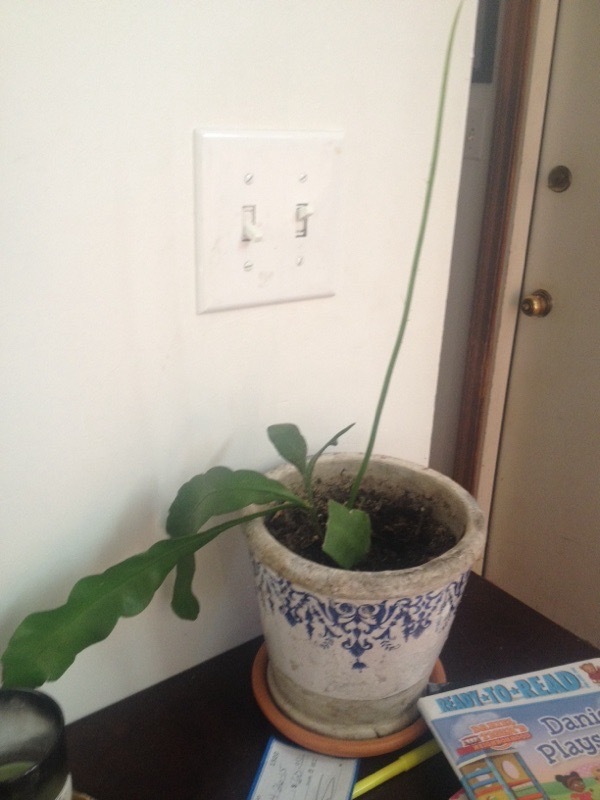 Usually there are offsets or "babies" of the mother plant that will take its place. Many do take over 20 years to bloom and the spectacular process may take months. The flowering is the natural culmination of its existence. Once the bloom has dried, many people keep it as a cut dried flower if they have the room! Outdoors provide excellent drainage, full sun and water sparingly, only when soil feels dry to the touch. 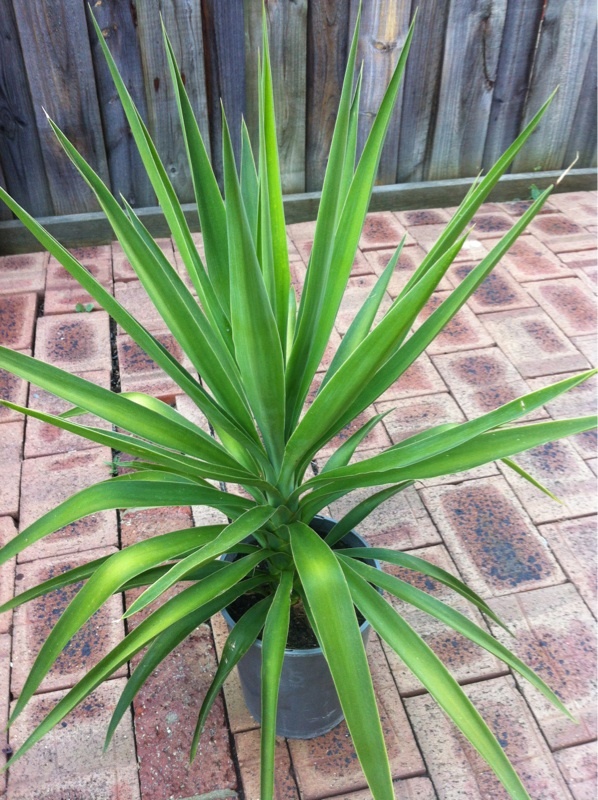 Prized for its tapered, pointed leaves. Indoors, provide the brightest, indirect light possible. At this stage could also be another Yucca, but we think it is an Agave. Native to Africa, flowers are very showy, star-shaped, and pale gold vividly patterned with rich burgundy speckles and transverse lines. This is a member of the Stapeliad family that includes Stapelias, Orbeas, Huernias, Carralumas, and others, and their main natural pollinators are flies. They mimic the smell (and in some cases the look as well!) of a dead animal to attract the flies. Requires porous soil with adequate drainage. Bright light and ample airflow. Water thoroughly when soil is dry to the touch. Water less during extreme heat and during temperatures below 70 degrees Fahrenheit. Will tolerate extreme heat as long as light is not intense. Prefers winter temperatures above 50 degrees Fahrenheit. Protect from frost. 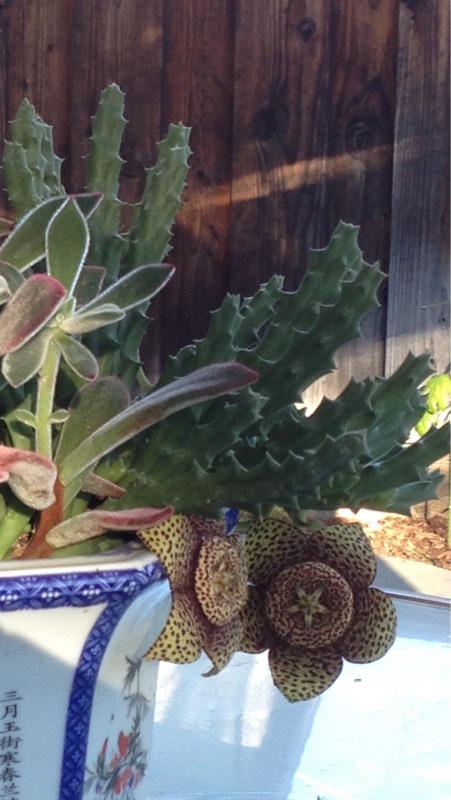 Your stunning flower is from an orchid cactus. It is from the tropics and bears gorgeous flowers in the spring or summer depending on the variety (may take 3-5 years to bloom from a cutting). In your area, it can be kept outdoors year round in filtered light and should be watered regularly as long as weather remains mild. Feed with a slow release fertilizer formulated for blooming plants. Tends to sprawl but that older growth is usually where the flower buds develop. If possible, bring indoors if frost is predicted and place in bright indirect light. 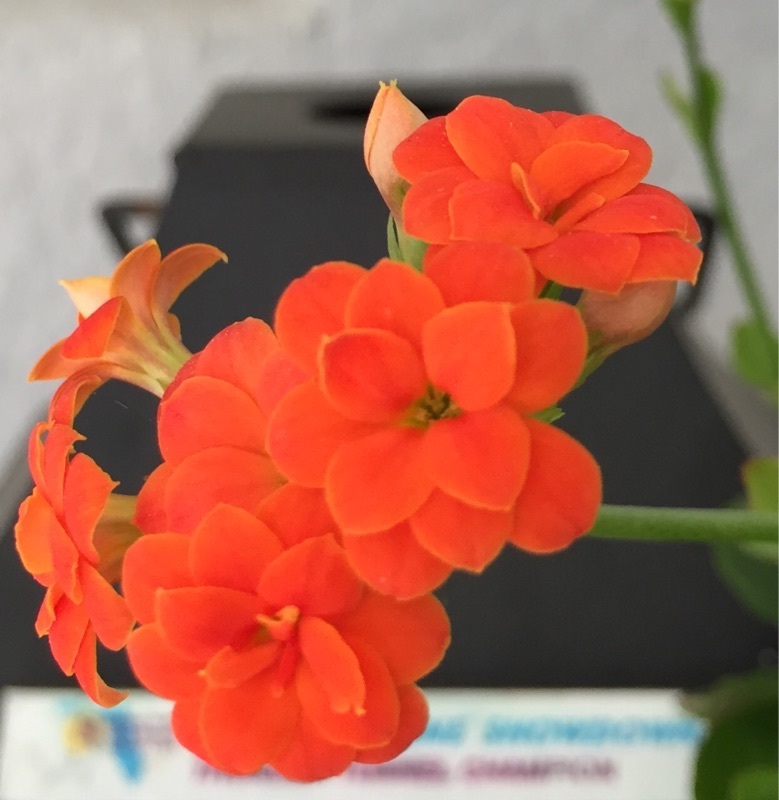 Best displayed in a large pot or hanging basket to show off the blooms. To flower, the plant needs more than 12 hours of darkness per night in early to mid-autumn. Avoid artificial light during this period. Kalanchoe tomentosa cv. Chocolate Soldier forms a shrubby plant with long oval shaped leaves densely covered in fuzzy felt. There are many cultivars with color variants, but the "true" tomentosa has dove gray leaves with reddish-chocolate margins and tips. This cultivar, 'Chocolate Soldier' has chocolate-colored leaves with nearly black markings at the tips. Very attractive, rich chocolate color provides an attractive accent with other plants. Flowers are small, but are quite uniquely attractive furry, bell-shapes that are golden ginger in color. Prefers bright light to full sun. Can be planted in patio plantings or even in garden beds in areas with temperate climes. Use porous soil with adequate drainage. Water thoroughly when soil is dry to the touch. Protect from frost. Haworthia turgida, native to Cape Province, South Africa, forms small rosettes with glassy green leaves with "crystalline" textures. Leaves are recurved at the tip, which is translucent and marked with green lines. Becomes reddish in strong light. Offsets freely to form small clusters quickly. Excellent for windowsill culture. 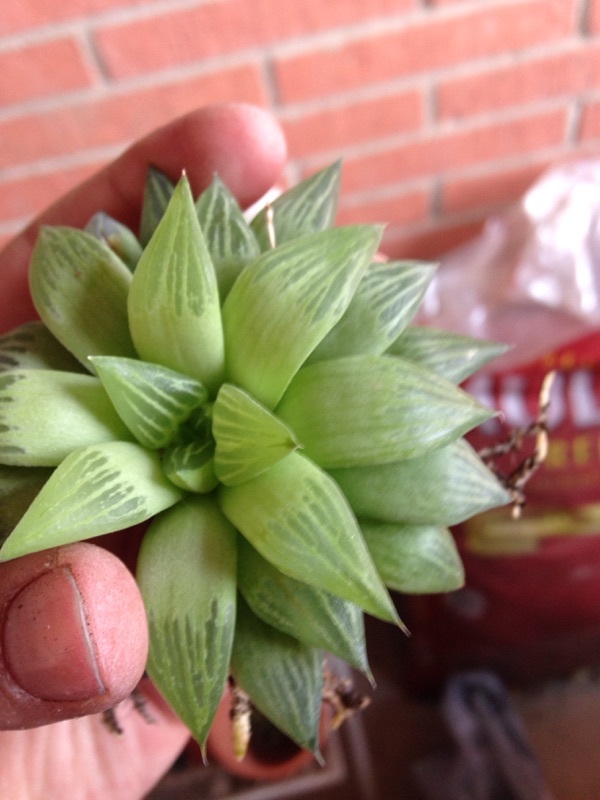 Haworthias are winter growers and are dormant in the hottest summer months. Require very porous soil with excellent drainage. Prefers filtered, very bright light. Those species with red veining or chocolate faces will exhibit superior color in bright light. All forms that are green, especially included the variegated forms, will prefer filtered light. Water thoroughly when soil is dry to the touch. Protect from frost. It is a cross of two South African succulents, Crassula perforata known as 'String of Buttons', with Crassula rupestris ssp. marnieriana. Baby Necklace is a very hardy and ornamental plant with small, rounded, fleshy leaves tightly stacked, and usually multicolored resembling a string of beads like on a necklace. This plant stays fairly small (6"-12"+ tall) and has excellent drought and cold tolerance though prefers some sun protection. Provide porous soil with adequate drainage. Full sun or very bright light and ample airflow. Water thoroughly when soil is dry to the touch. Water with caution in winter, as the plant can lose its roots if the soil stays cold and wet for extended periods; protect from frost to prevent scarring.